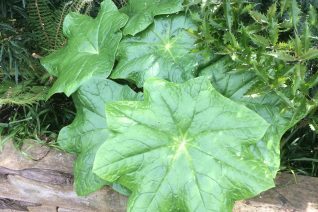 Bold species of Asian Mayapple with huge glossy leaves 2′ across with finely serrated angular sides. To 4′ tall and multiplying first by an expanding the immediate clump then in subsequent years it roams via stolons. In time creating prodigious colonies. In May/June pendant deep red odiferous flowers radiate from below the leaves and may be followed by ripening “apples” into autumn. Rich, well drained soil with regular summer irrigation. Part shade to full shade. Requires ample protection from bright sun. Winter deciduous.